Click the button or press the Insert key. The Golfer Information form will appear. ID#: Type the ID NUMBER. Note: If you choose not to assign an ID number HS will automatically assign one. All reports have an option to NOT show ID#s. Unique ID#s are required if you are using the Easy Entry System, Tournament Management System, or League Management System in conjunction with HS. ID#s are used to transfer information between these programs. Index: Type the golfer's current Index. Note: The Index can be left blank. This value remains constant until a valid index is calculated. An index is only calculated when using the "USGA HANDICAP(tm)" calculation mode. USGA requires a golfer to have at least 5 scores before an index can be calculated. Handicap: Type the golfer's Handicap. Note: The Handicap can be left blank. This value remains constant until a valid handicap is calculated. Gender: Mark the correct gender. HS selects the appropriate rating and slope of each tee according to set gender. Enter the appropriate data for the remaining fields. Any of the fields can be left blank. Click the Addresses, Miscellaneous, Notes to view other fields. Many of these fields appear on standard reports. For example, if you enter addresses, you can print mailing labels and address directories. 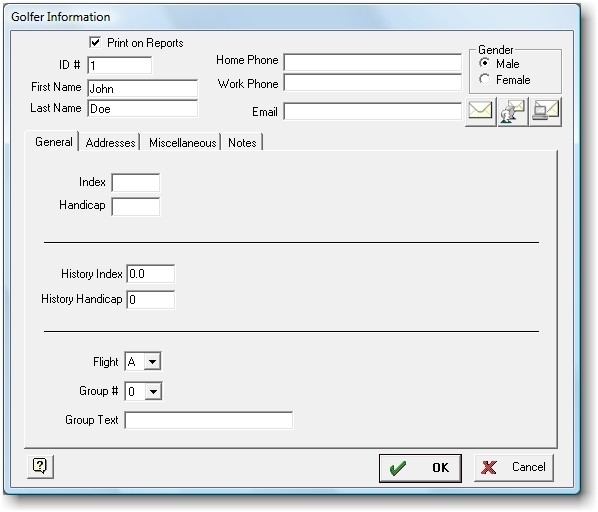 Any field can be displayed on custom reports (see Custom Reports and Custom Views). You can even create custom fields for tracking any information your group may need (see Roster Options). Double-click the golfer or press F10 key to Edit a golfer. Tip: To quickly move to a golfer, type his\her ID Number or last name. Highlight the golfer to delete and click the Delete button, or press the DELETE key.